A research team from the University of Bonn has succeeded for the first time in using light stimuli to stop life-threatening cardiac arrhythmia in mouse hearts. Furthermore, as shown in computer simulations at Johns Hopkins University, this technique could also be used successfully for human hearts. The study opens up a whole new approach to the development of implantable optical defibrillators, in which the strong electrical impulses of conventional defibrillators are replaced by gentler, pain-free light impulses. The Journal of Clinical Investigation has now published the results. Ventricular fibrillation! When the heart muscle races and no longer contracts in an orderly fashion, sudden death often follows due to the lack of blood circulation. In such an emergency, a defibrillator helps to restore normal heart activity by means of intense electrical shocks. In patients with a known risk for these arrhythmia, the prophylactic implantation of a defibrillator is the treatment of choice. If ventricular fibrillation is detected, a pulse of electricity is automatically generated, which normalizes the excitation of the heart muscle and saves the person's life. "When an implanted defibrillator is triggered, which unfortunately can also happen because of false detection of arrhythmia, it is always a very traumatic event for the patient", says the head of the study, Junior-Professor Philipp Sasse of the Institute of Physiology I at the University of Bonn. "The strong electrical shock is very painful and can even damage the heart further". Therefore, Professor Sasse's team investigated the principles for a pain-free, gentler alternative. As the scientists have now shown, ventricular fibrillation can be stopped by optical defibrillation. The team used the new method of "optogenetic" stimulation of mouse hearts, which had genes inserted for so-called channelrhodopsins. These channels are derived from a green algae and change the ion permeability of heart cell membranes when illuminated. When the researchers triggered ventricular fibrillation in the mouse heart, a light pulse of one second applied to the heart was enough to restore normal rhythm. "This is a very important result", emphasizes lead author Dr. med. Tobias Brügmann of Professor Sasse's team. 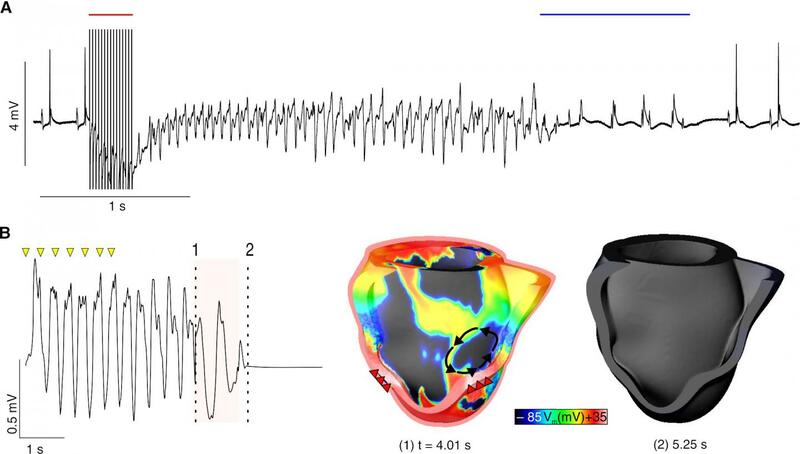 "It shows for the first time experimentally in the heart that optogenetic stimulation can be used for defibrillation of cardiac arrhythmia". It also worked in normal mice that received the channelrhodopsin through injection of a biotechnologically-produced virus. This shows a possible clinical application, because similar viruses have already been used for gene therapy in human patients. But are the findings with mouse hearts applicable to humans? In order to answer this question, the scientists at the University of Bonn are working together with Prof. Natalia Trayanova's Computational Cardiology Lab at the Institute for Computer Medicine and the Department of Biomedical Engineering at Johns Hopkins University (Baltimore, USA). There, optogenetic defibrillation is being tested in a computer model of the heart of a patient after cardiac infarction. "Our simulations show that a light pulse to the heart would also stop the cardiac arrhythmia of this patient", reports Research Professor Patrick Boyle, who is also a lead author. To do so, however, the method from the University of Bonn had to be optimized for the human heart by using red light to stimulate the heart cells, instead of the blue light used in mice. This aspect of the study demonstrates the important role that can be played by computational modelling to guide and accelerate the systematic development of therapeutic applications for cardiac optogenetics, a technology that is still in its infancy. "Our data show the fundamental feasibility of optogenetic defibrillation for the treatment of ventricular fibrillation", summarizes Prof. Sasse. Using light to return the fibrillating heart to a normal rhythm can be expected to be pain-free and much gentler for the patient than the use of electric shock. However, the new method is still in the stage of basic research. Until implantable optical defibrillators can be developed for the treatment of patients, it will still take at least five to ten years, estimates Prof. Sasse.